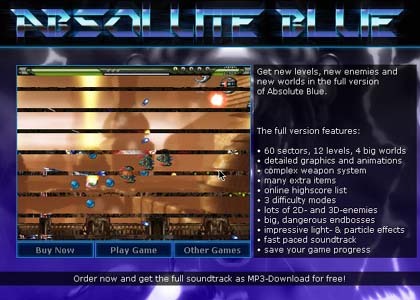 Free download Absolute Blue game for PC. It is free to play fantastic shooting, action, adventure and arcade game. 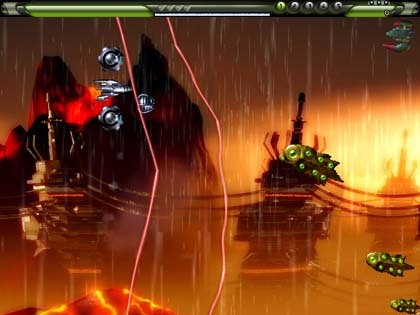 The game has 60 sectors of pure adrenaline pumping action with cool and awesome visual graphics and sounds. Absolute Blue is a game that assures you to please. During the gameplay the players can also improve their ships by upgrading them. After the up gradation the ship is transformed into a devastating battle force. This upgrading is really a need in the game Absolute Blue because the players cannot fight against the waves of enemy fighters with a little ship and the other dangerous thing is that the enemies are endless i.e. if the player stops, they will keep on coming one after other and in group forms, too. In the gameplay of Absolute Blue the players have to face some weird and odd creatures to fight and kill them. The theme of the game is to save the mankind from the attack of all these weird enemies. Absolute Blue is featured with 60 sectors. The game has 12 levels and 4 huge worlds to cross and fight all the enemies in it to clear and set free that world from the attackers.